Home / Crochet / Wistful or how to gross your readers out – Updated! Wistful or how to gross your readers out – Updated! I gaze longingly at the Secret Pal swaps at Crochetville. They sound very interesting. But I’m restrained by a couple of things…. -> Most (if not all) SP packages seem to include yarn and/or other crochet accessories. I can’t think that what we get here will actually be worth sending out to anyone…Not yarn or hooks, definitely. That only leaves endless amounts of my own handmade stuff, which would get boring after a time, I should think! Has anyone been in a Secret Pal swap which didn’t involve yarn/hook items? -> Given Crochetville has about 3 and a half participants from India, how “secret” a Secret Pal would I be, anyway? If you are still reading this and haven’t rushed off to to strike me from your blogroll subscriptions, maybe you could tell me what you think….I should stick to RAOKs and Christmas in July and the occasional doily swap, I think. I’m hugely gratified by the number of comments I’ve got on this post. So many of you have taken the time to write in, and with so much thought behind your comments, I love reading all of them. Next post: YAY! I won again! I’m sure this comment may draw ire from some readers, but stick with the RAOK, Wish List and occasional doily swap. The expense of postage does not count towards the total and if you get a SP who ignores you, you are disappointed anyway. My last round was good, this one not so. Even the person I send to doesn’t post much and doesn’t thank me, etc. It’s disappointing. Yarn swap can be the same, I had good swaps and not so good swaps. And I am in no way trying to offend or hurt or anything like that. I love the Secret Pal swap. While secret pals are fun, and I’m having a good time with my first one, it’s almost as much fun to find someone who has a wishlist with something you can grant, then add stuff to it that you think they’d like (after reading their posts and visiting their blog or website). Kind of a mini-secret-pal thing. Swapna… I think it’s best to stick to RAOK or swap which are one item or a couple…Being overly practical it’s not really logical to participate. Not to worry, swaps will always be going on and RAOK! Misfit [what is your name anyway? :-)], yes, it does sound like postage can get expensive from India. But to answer your question about being in a SP Exchange where crocheted items were received, yes, I was in one where I received crocheted items, and I loved it! If you wanted to participate with that in mind, I don’t see why not! It’s not a “Yarn Swap” so if you didn’t want to send yarn, you wouldn’t have to. I think crocheted items are lovely, too, and I don’t think someone would get “bored”! 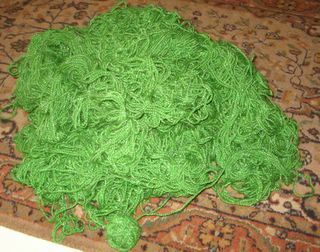 Perhaps sometimes some of us just get into a habit of sending yarn and accessories, but it hasn’t been stated that that’s what you have to send, only that you have to send at least one package in the 3 month period with at least one crochet-related item in it – that could be a doily you made. You can fill the rest of the time with e-cards and notes to your SP. I hope you’ll have fun and enjoy some of the swaps, but that is just something you’ll have to decide. Don’t let the fact that you could only send hand-made items deter you. Those are wonderful gifts! Well.. the postage can´t be changed.. but as far as how secret pal you can be… I tell you.. I´m in Spain, and I´m the ONLY one there! LOL!! but you can always put your pal address in the “from part of the envelope”… But in the end… it´s all about having fun.. so that wouldn´t matter really..
Um, I do make quite a few socks… 😉 If you have questions, ask away!